"I am here to gather intelligence. Groo is in great need of intelligence!" As I was getting ready to start this month's column, a process which involves such vital warm-up activities as napping, snacking, and watching TV, my good friend Roger Price cell-phoned me from the floor of the Baltimore Comic-Con to tell me that Sergio Aragones, that MAD cartoonist who created Groo the Wanderer, would be a guest at this year's Mid-Ohio-Con. Since Groo collaborator Mark Evanier will also be at MOC and since this year is Groo's 25th anniversary, the odds of the show having a Groo anniversary panel are at least as good as someone asking Sergio and/or Mark about mulch. I pray that someone isn't me. We're firm believers in full disclosures here at TOT Central, so I should tell you that Roger Price, besides being my friend and all, is also the guy what puts on Mid-Ohio-Con every year. I also need to mention that I am the Program Director of the convention, the guy what comes up with, schedules, and manages the con panels, and that Mid-Ohio-Con is, bar none, my favorite comics convention in the known universe. Mid-Ohio-Con is like the family reunion from Heaven. The show seems to attract some of the nicest fans and guests you could want. This year's event, which will be held Saturday and Sunday, November 24 and 25, in Battelle Hall at the Columbus Convention Center is no exception. I'll get to spend the weekend with old friends and meet new friends...and I won't even have to bring my Sainted Wife Barb's famous mixed fruit bowl. The esteemed Price, ever the showman, came up with the notion of saluting the Bronze Age of Marvel Comics by gathering together - cue the stirring fanfare - The Men of Bronze. The "team" consists of Rich Buckler, Gary Friedrich, Michael Golden, Keith Pollard, Roger Stern, Herb Trimpe, Ron Wilson, and me. I'm not sure if we should do a panel together or go out and fight crime, but I'm sure excited at the prospect of reuniting with old pals and co-workers, including some (Rich, Keith, and Ron) I haven't seen in a decade or two. I think they all still like me. There will be lots of other cool guests as well. Doug Jones, who portrayed the Silver Surfer and Hellboy's Abe Sapien, will be on hand. The guy is two super-heroes in one! Feedback, winner of last year's Who Wants to be a Superhero?, will be introducing the Defuser, winner of this year's competition, to the Mid-Ohio-Con crowd. Feedback was one of the most delightful guests we've ever had and I'm looking forward to seeing him again and meeting his new super-hero pal. This is the point in these annual Mid-Ohio-Con plug fests that I realize writing about all the show's great guests wouldn't leave me any room to review anything. So I won't be able to write about Noel Neill, Mark Goddard, Robin Griggs, Tom Batiuk, Justin Chung, Joe Corroney, Dave Dorman, Jan Duursema, Matt Haley, Carolyn Kelly, Barry Kitson, David Mack, Tom Mandrake, Don Rosa, Steve Rude, the good folks from the Hero Initiative, Moonstone Comics, the Guardian Line, and more, not to mention CBG's own Maggie Thompson and Brent Frankenhoff. Because if I had room to mention Maggie and Brent, I'd also have to write about Mid-Ohio-Con's "Maggie Thompson Roast" and...well, you see my dilemma. So why don't I just get to this issue's reviews? We can talk more about Mid-Ohio-Con another day. The Nostalgia Ventures reprints of the classic Shadow and Doc Savage pulp magazine novels are entertaining and informative. 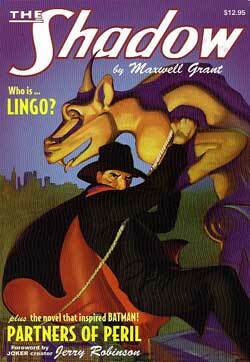 But, for comic-book readers, THE SHADOW #9: "LINGO" AND "PARTNERS OF PERIL" ($12.95) is the most important volume published to date because it changes everything we thought we knew about the creation of one of comicdom's true icons, the Batman. In this book, series editor Anthony Tollin reprints the Shadow adventure - "Partners of Peril" - from which the very first Batman story was plagiarized by a young Bill Finger, almost certainly with the knowledge and approval of Batman creator-of-record Bob Kane. My respect for Finger, who quickly became one of the best and most creative writers in the Golden Age of Comics, is great, but there's no getting around the fact that his first Batman story was lifted from a Shadow story by Theodore Tinsley, the "fill-in writer" who wrote over two dozen Shadow novels in the, ahem, shadow of Walter B. Gibson. Historical essays by Tollin and Will Murray, as well as a foreword by Kane collaborator Jerry Robinson, present additional revelations. It's easy to see why "Partners" made such a great comics story and more than a little impressive to realize how much of the novel Finger got into the mere six pages allotted to the Batman in Detective Comics #27. This is an exciting adventure with multiple murders, a fiendish killer, diabolical death traps, and interesting settings for the action. It's a much better story than the Gibson-written "Lingo," a pedestrian tale with few moments of real jeopardy, few surprises, and a master plan by the Shadow to disrupt organized crime that's far more complicated that it needed to be. However, as Tollin points out, "Lingo" does have the Shadow using what could be considered the inspiration for the Batman's batarang. Bruce Wayne should pay royalties to the Shadow. The volume concludes with a second Tinsley story called "The Grim Joker" wherein ace detective Bulldog Black goes after a crime boss with that name. Tollin doesn't claim concrete evidence that this villain, described as "a living corpse in the costume of a gay Harlequin," influenced the creation of the Batman foe, but presents the short thriller as a "historical curiosity from the same veteran wordsmith whose 1936 Shadow novel inspired the 1939 creation of Batman." Be ye a fan of the Batman or pulp adventure, The Shadow #9: "Lingo" and "Partners of Peril" is a must-have, must-read book. It earns the full five out of five Tonys. What would you do if a corporation ran your life? That's the key question of TEEN, INC. [Walker; $16.95], a young readers novel by comics veteran Stefan Petrucha. Jaiden Beale is a 14-year-old boy whose parents were killed in an accident caused by faulty equipment made by NECorp. As part of the settlement, which will award Jaiden millions of dollars when he becomes an adult, the corporation "adopted" him. He lives in their skyscraper headquarters and his life is managed by corporate execs. His one link to the real world is that he attends a public school and that link is imperiled when he discovers evidence of manifest wrongdoing by NECorp. This is an impressive novel on several levels. Petrucha does a fine job making Jaiden real and making his unlikely circumstances convincing. He also balances the anti-corporation nature of this book with an awareness of the benefits corporations can bring, the consequences of even positive and well-intentioned ventures, and a number of corporate types who prove to be more than just obedient drones. The melodramatic conclusion does strain my tolerance of coincidence a tad, but my overall impression is that Teen, Inc. is an exciting, human, and meaningful story I believe will be embraced by its target audience. 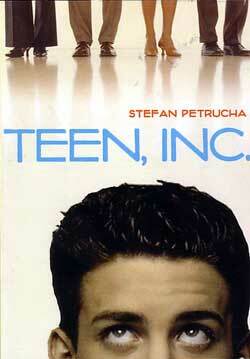 Teen, Inc. would also make one heck of a movie. But, since I don't own a studio, the best I can do is award Petrucha's book four out of five Tonys. "He Was So Good It's Scary," detective Yoe's uncovering of the one of the most obscure comic-book cover artists of all. Arf Forum is a bargain at twenty bucks. Even the stuff that doesn't float my boat is worth reading. That's why it earns four out of five Tonys. Excluding Jack Kirby and Steve Ditko, there is no more pivotal Marvel Comics artist than John Romita. During his tenure as Stan Lee's collaborator on Amazing Spider-Man, Romita took the title to its long-held spot at the company's best-selling title. He showed a generation of artists how to adapt the storytelling lessons to be learned from Kirby and Ditko to their own styles. He even trained a legion of extraordinary artists during his time as Marvel's art director. On every level of comic-book artistry, Romita stands as a benchmark of excellence. 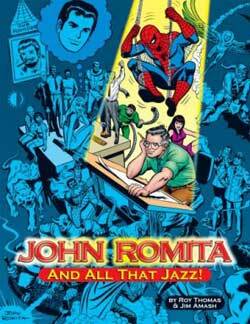 I already knew all this, but JOHN ROMITA...AND ALL THAT JAZZ! by Roy Thomas and Jim Amash [TwoMorrows; $24.95] brings it all into focus with the most definitive Romita interview ever, surrounded by so many fantastic Romita illustrations than you, too, tiger, will feel you've hit the jackpot. From Romita's earliest professional art to more contemporary works, this book takes you through fifty years of comics history. In Romita's own words, you'll see the dedication and integrity and just plain common sense that makes him a comics legend. If I were as smart in the 1970s as I am now, I would've asked for my desk at Marvel Comics to have been moved into his office. It would've been like earning a PhD in making comics. I'll spare you the many paragraphs I could write gushing about Romita's impeccable character and amazing talent. It's all there in John Romita...and All That Jazz!, which is why this book earns the full five out of five Tonys. 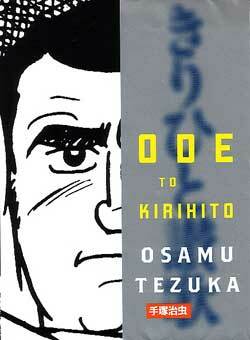 Osamu Tezuka's ODE TO KIRIHITO [Vertical; $24.95] explores the human and the animal in all of us. A dedicated young doctor goes in search of the cause and the cure of a strange disease which is turning humans into dog-like creatures. But others manipulate his mission of mercy to suit their own ends. In this work's 800-plus pages, Tezuka brings us an army of fascinating characters, weaving them into an emotional, engrossing, suspenseful epic of arrogance, brutality, greed, love, loss, and an ultimate triumph of the human spirit. It was nominated for an Eisner award and, with no disrespect intended to the winner or other nominees, it should have won in a landslide. Ode to Kirihito earns the full five Tonys. If you take only one of my recommendations to heart this month, take this one. You need to read this amazing graphic novel. SHOWCASE PRESENTS THE WAR THAT TIME FORGOT [DC; $16.99] is a dish best served to the 10-year-old kid in all of us and digested over several weeks. 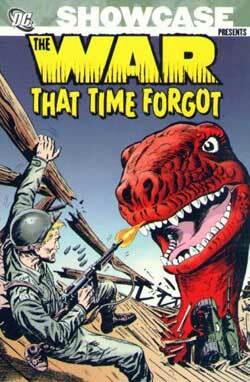 The soldiers-versus-dinosaurs battle royals are among the goofiest Silver Age of Comics stories of them all and great fun in small doses. But, if you read more than two in one sitting, their myriad flaws manifest themselves. 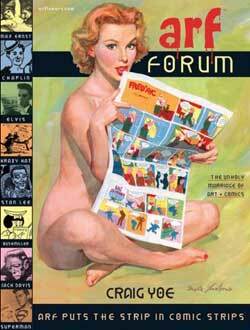 Writer/editor Robert Kanigher was one of comicdom's true mad geniuses. He could made the nuttiest stuff work in his comics. He wrote fast and he wrote furiously and he rarely looked back at what he had previously written. So we have a squad of acrobat brothers who stumble into one dinosaur danger after another with every one of their several stories coming across as their first meeting with these beasts from another era. In some of these stories, they were big stars before the war. In others, they are struggling to get an agent to notice them. If the human characters are off the wall, such as the soldier determined to avenge his brother's death in a bobsled accident, the dinosaurs owe more to Godzilla than paleontology. They are huge, big enough to pick up bombers and submarines. But this was a good thing. Just ask any kid who read these comic books when they were first published in the early 1960s. The art on these stories was garish and exciting. Ross Andru and Mike Esposito had a knack for drawing dinosaurs that captured our imaginations. Some of the last stories in this collection are drawn by Russ Heath, Joe Kubert, and Gene Colan, but, good as they were, they couldn't match the Andru/Esposito energy. Showcase Presents The War That Time Forgot is a bargain at its full price and an even bigger bargain if you look for the discounts that are readily-available. These stories aren't the best of the Silver Age, but they are still grand fun. With thanks to RK, Ross, and Mike, this book earns four Tonys. It's like writer Marc Guggenheim and artist Paul Gulacy were looking at a "Tony Isabella's Buttons" checklist when they created SQUADRON SUPREME: HYPERION VS. NIGHTHAWK [Marvel; $10.98] because this graphic novel has much of what I love in contemporary comic books. There's Hyperion, a well-intentioned authoritarian stooge who is kind of like Superman without the innate goodness that came from being raised by Ma and Pa Kent. There's Nighthawk, a strong black man who will brilliantly and determinedly buck authority for a noble cause, which, in this case, is using his abilities to halt genocide in Africa, a real-world tragedy that should be uppermost in the minds of decent governments and people everywhere. There's conflict between strong protagonists. There's gritty and realistic artwork. There's clear storytelling. There's action and suspense. There's even as satisfying an ending as the terrible complexity of the tragedy could allow. Remember what I said about Ode to Kirihito being, of all the books I'm recommending this column, the one you should read and buy before all others. 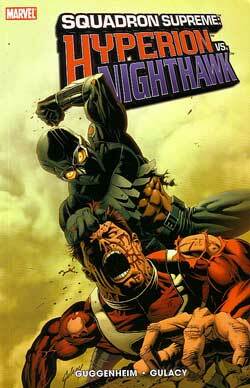 Well, Squadron Supreme: Hyperion Vs. Nighthawk is the book you should buy and read next. It earns the full five out of five Tonys. The Spider-Girl Universe continues to be a fun place to visit and Marvel's making it easy to do so with its series of manga-size collections. 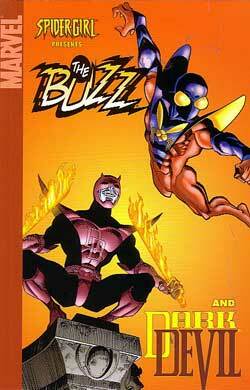 This time, I'm recommending SPIDER-GIRL PRESENTS THE BUZZ & DARKDEVIL [$7.99], which collects both three-issue mini-series starring those characters. Writer Tom DeFalco does a nice job of creating this universe from the Marvel Universe titles of the 1980s and 1990s. For all of the continuity details, the stories are amazingly easy to enjoy and follow. The Buzz has ties to Spider-Girl and J. Jonah Jameson, as well as the surprise return of Doctor Octopus. Darkdevil combines elements of Daredevil, Ghost Rider, and the Spider-Man clone saga. Both series have clear and exciting storytelling by co-plotter and penciler Ron Frenz with finished art by, respectively, Sal Buscema and Al Milgrom. The current Marvel Universe, which I do enjoy, might be a bit too gritty and realistic for many Marvel readers of olde. I think those readers will enjoy what DeFalco and his artists have created in Spider-Girl and its related titles. That's one more reason why Spider-Girl Presents The Buzz & Darkdevil earns an impressive four out of five Tonys. I tweaked the opening a touch, but there was no getting around that I wrote this column three months before Mid-Ohio-Con actually took place. Now, with the convention over a month in the past, it seems obsessive to do any kind of a full-blown convention report. However, since I have some pretty spiffy photos of Mid-Ohio-Con and a stack of review items I was given at the show, you can expect to see some "Mid-Ohio-Con Moments" in upcoming TOTs. In the meantime, I'll just say that, in the long history of great Mid-Ohio-Cons, the 2007 event was one of the very best. Well done, Roger Price. Well done. Thanks for spending a part of your day with me. I'll be back on Monday with more stuff.